Running the 7.62x39 in the AR15 platform has gotten somewhat of a bad rap. Read through forums and you would think people are a little bi-polar with one post saying they could never get it to work and the next post noting they bought one off the shelf or built one and never had an issue. Kinda like people who love or hate the 300 Blackout. Just as I was a fan of the previously cheap-to-shoot 5.45x39 round, I am a fan of the now cheap 7.62x39 round. Prices on that 5.45x39 round shot up a bit after they prevented cheap import surplus rounds, however the 7.62x39 round is still cheap and has been even through the great ammo crisis of the last ten years. I am not kidding… I could actually walk into Cabelas and buy whatever quality I wanted of $6 per 20 boxes of steel cased AK-47 rounds. I have a lot of time behind my AK-47 at this point thanks to 7.62x39 ammo availability. Currently, I am seeing that the venerable 7.62x39 round is still consistently 20%+ less expensive than .223 for plinking rounds. My thought was why not complete a build that could save enough money on the first 2000 rounds to pay for the entire 7.62x39 AR15 upper… you know, if I can get it working. WHY A 7.62x39 AR15 UPPER? Some people will ask why you would ever want a 7.62x39 AR15 upper. 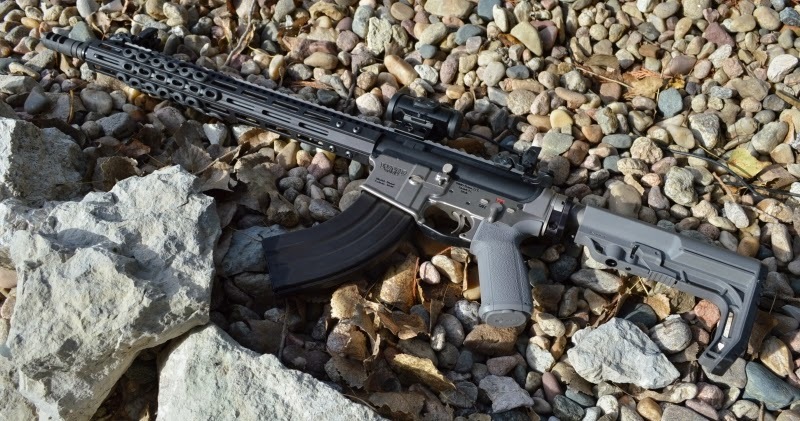 Beyond the cost savings facts, the 7.62x39 is actually a more versatile round in many respects than the 5.56 Nato round and has proven itself as a better deer and hog round by AK47 hunters. Heck, the 7.62x39 round is basically just an up-powered 30-30 round which is arguably the most successful deer hunting round in America. The 7.62x39 delivers more energy than the 5.56 Nato/.223 Remington or 300 Blackout out to the 200 yard mark which is where over 95% of training, plinking, defensive and hunting shooting is done. Many will say why not just use the 300 Blackout? Well from my experience the 300 Blackout round shares many of the same functional reliability problems as the 7.62x39 round running in an AR15 unless either caliber are well tuned. Yes... yes, I know your 300 BO rifles runs great, mine needed tuning to run both subsonic and high velocity rounds. Add in the 300 Blackout is still $1.00 a round compared to $0.40 per .223 round and $0.30 per 7.62x39 round. The 300 Blackout has its place, however a working AR15 7.62x39 upper can deliver more power for less money... you know, if I can get it working. The most significant problem with the AR15 format running AK-47 ammo has been feeding and functioning. There have been a lot of theories on what exactly is needed to make the round run in the AR15, however usually it seems to come down to recommendations to start cutting on magazines and I don’t think magazines alone are the culprits. I wanted to see if I could figure it out for you my Pandemians and in the process have some fun with this awesome round. Every possible problem I could have experienced with this build, I did and nothing came easy. 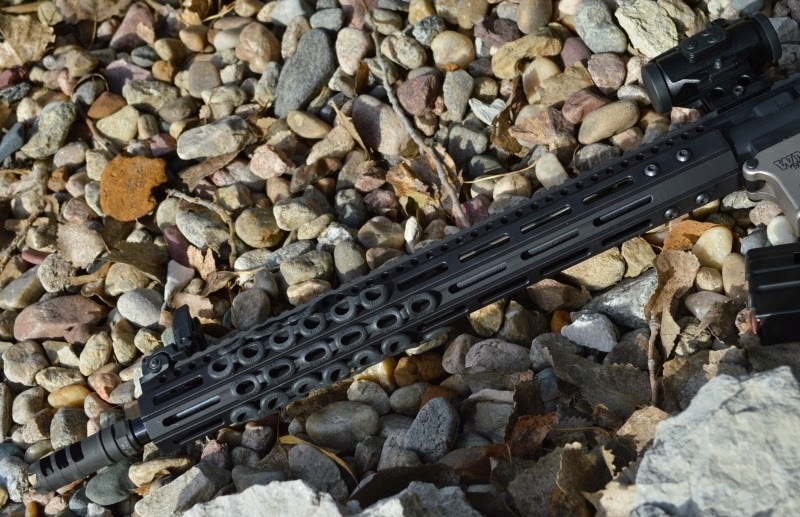 I placed an order with Delta Team Tactical for a $139 16” 7.62x39 Melonite Barrel with a Carbine length gas system and their complete $139 7.62x39 Phosphate Bolt Carrier Group. Although inexpensive and high quality products, the company could not have screwed up my order more if had been somehow intentional. A month later and I was still working through them sending me the wrong thing… again, but problems were eventually resolved. I plugged the barrel in a Anderson Manufacturing blemished $40 upper and then used a new Parallax Tactical M-Lock forend. The only real high dollar components on the upper were a Fortis gas block and a Lantac Dragon comp to take the bite out of the heavier recoiling round. A Lucid red dot topped the upper, however it would be months before I was able to really get to using it. For the majority of testing I used my WMD Beast lower. Once assembled, I ran to the range excited to function test the build. Testing centered around the inexpensive ammo with a couple steel cased Wolf and Cabelas Herter's 7.62x39 rounds using Magpul Pmags and some C-product 6.8 SPC mags which some had noted would work just fine if used with just a few rounds... they didn't. The upper would not feed more than one round at a time and even then seemed to still jam the first round on the center of the M4 feed ramp and in many cases would not even fully extract. When the gun did cycle, the gun was also short stroking big time and was nowhere near approaching the point where it would lock back on the magazine. Problems? I had problems. Surprisingly the only problem I did not have was detonation. Many have noted that you need a special firing pin, however at least with this standard Mil-Spec lower trigger, there were no detonation issues. After the first time out, I realized the gun was way way way under gassed with a far too small barrel gas port hole, I also needed a dedicated Ar15 7.62x39 magazine for testing, and needed some work on the barrel's feed ramps. Many range trips later of test, fail, tinker, and repeat, I had polished the feed ramps to a mirror finish and drilled out the barrel gas port to a huge 1/8 (.125") size and suddenly the gun was locking back and at least trying valiantly to pick up the next round in the magazine. Jam city baby even with the C-Products dedicated 7.62x39 magazine feeding FMJ, but I really could not fault the magazine. There was more wrong here than magazine issues and what my aggressive feed ramp polish would resolve. That split feed ramp was an issue. What I found was that most people had figured out the gas port size problem, however feeding was always an issue and I saw only one company address it completely and that was Bushmaster. 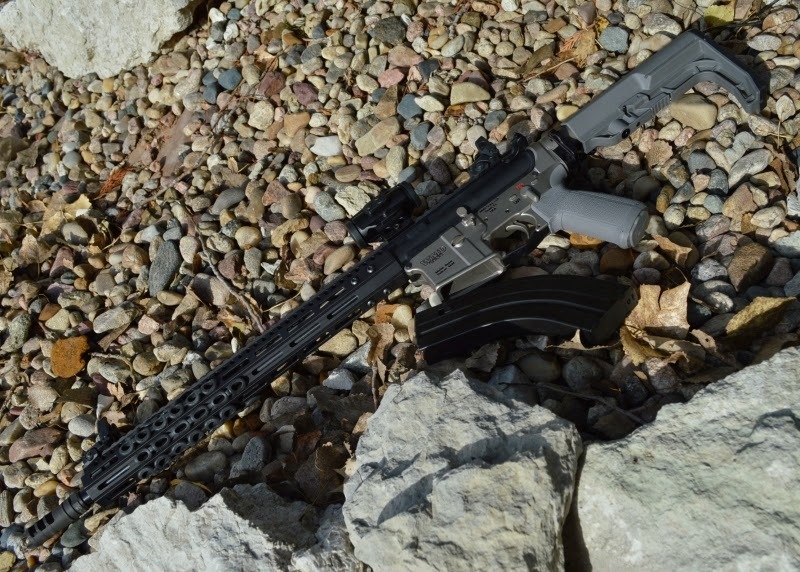 Bushmaster offered a 7.62x39 rifle and from all accounts it fed and functioned like a dream. The main design difference in these rifles were oversized gas ports and they featured a single large feed ramp which in essence removed the split between the M4 feedramps to just form one giant ramp. 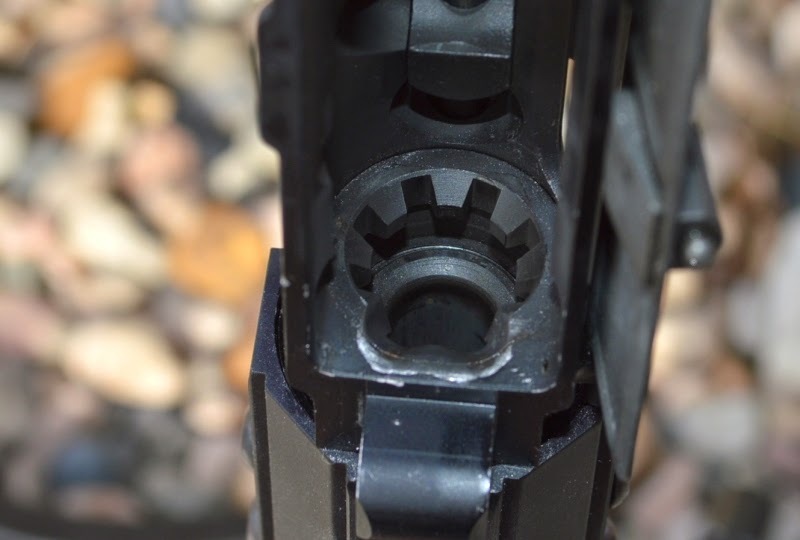 This made sense because due to the tapered case of the AK47 round the round would angle toward the center of the feed ramp when the bolt attempted to pick up a round and guess what is in the middle, yep the split in the middle of the M4 feed ramps. So, I whipped out the Dremel and got to grinding away the split. Sure I took a couple deep breaths before I basically trashed a perfectly good barrel extension, however in my mind it had to be done. It worked and worked perfectly. In fact now I can fed this upper with pretty much any magazine, however the C-Products dedicated 7.62x39 magazines delivered the best high capacity performance. I would expect any unmodified Stoner and ACS clone 7.62x39 magazines to deliver the same performance. I have now put twenty full mags through this upper running on a variety of lower receivers including the WMD Guns Beast lower and it has performed outstanding. In fact I have had zero functional issues in those 600 rounds other than the very occasional bad round which is expected with inexpensive ammo. WHY HAS SOMEONE NOT FIGURED THIS OUT BEFORE? Well they have. Bushmaster did, however it was just not very popular and they discontinued it. From what I can tell the single large feed ramp idea died with the discontinued product line. The prevailing issues which would solve all the major issues are that the gas port sizes are almost always too small for the 7.62x39 round and that the split M4 feed ramps only cause jams. If barrel manufacturers delivered a single large feed ramp and 1/8" gas port hole in the barrel, almost all the issues would be resolved. Add in some dedicated 7.62x39 magazines and you are good to go. If you have feeding issues, Dremel out the middle of the M4 feed ramp and its likely any feeding issues you are having will disappear. If your bolt is not locking back on the last round, you probably need a larger gas port. In my case I needed to enlarge mine to 1/8", you might be able to get away with a smaller port depending on your build. This process is as simple as removing the gas block and then carefully drilling out the gas port hole to a larger size. I would start smaller and slowly increase the size. Apparently there are many people who have been able to just buy working 7.62x39 uppers slam in a dedicated 7.62x39 magazine and start rocking the round, however the vast majority of folks have issues of some sort. 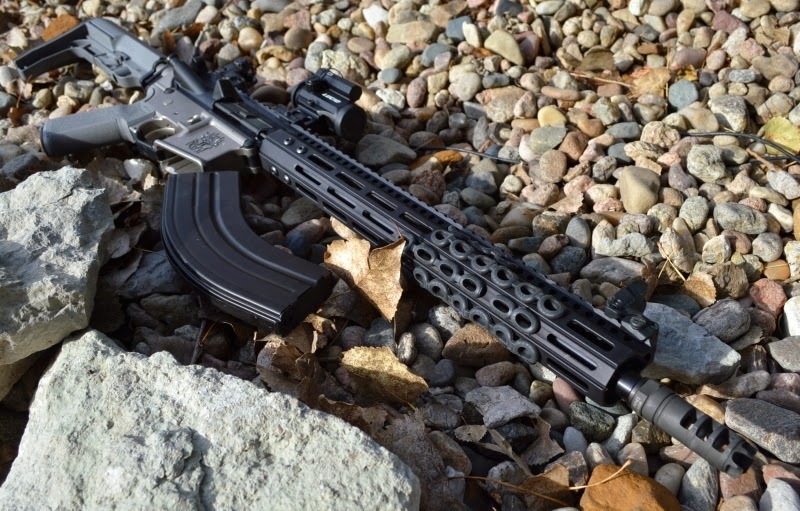 Hopefully my tips and modifications of a ground up build will allow you to build and enjoy a problem-free AR15 7.62x39 upper and save some cash in the process as you enjoy a cheaper to shoot AK47 round. Next up? How about a 7.62x39 AR15 pistol build. This is good stuff. I've given serious to this but couldn't make the financial risk without a guarantee of payoff. But this makes it look like a viable option! Thanks for your work. What kind of groups does it print at 100m? what kind of groups does it print? I'm really interested in this kind of build, but i have a 2 moa minimum. For the most part I am seeing around 1"-1.5" groups on most days. With quality ammo like Hornady rounds, I can stay closer to the 1" range. Great article. I have built a similar dedicated 7.62x39 upper and love the set-up but have one issue I have not been able to overcome. After every single shot the bolt catches and I have to hit the release manually to chamber the next round, which then feeds fine in most instances. I'm using ASC 30rd Magazines and the issue happens with every one of them, every shot. Did you experience that at all throughout your build or any thoughts on what would cause it? I don't have that issue. I would try to see what the bolt is catching on. If you have a full magazine, there is no reason the bolt catch should be activating. I am struggling with this build. Similar issues but haven't tried any modifications. I have a PWS Diablo that I failed at the range today. Yes, I am going to contact them. 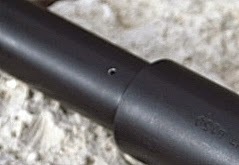 When you drill the gas port to a larger size, do you need to take precautions with any burrs on the inside of the barrel? I am thinking about running a short barrel (around 11 inches) and putting on a suppressor. To help with that, I am also going to use an adjustable gas block. I know gas blocks are generally bigger, but do they go up to 1/8 inch? Can you take a couple of more pictures of the Dremel work on the feed ramps? Finding this article tonight was simply fate. Bad Dreams - a BAD lever has nothing to do with it, however I hate the damn things because they do cause issues here and there with just real estate inside the trigger guard. 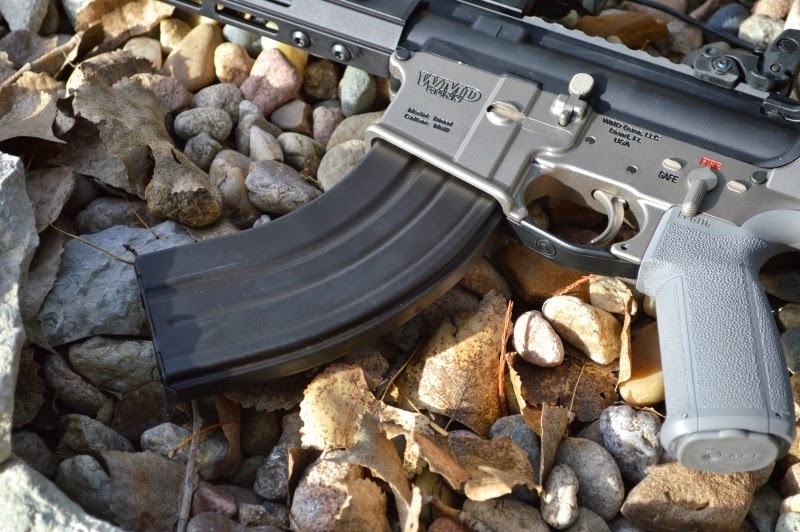 Vic - 7.62x39 ARs do not need adjustable gas blocks unless you open up the gas port too much. Like the 300 Blackout this round lack the back pressure with a standard .223 barrel port for reliable operation. I did not worry about burrs, however you SHOULD have a wooden dowel or something in the bore to prevent overshooting the drill out and harming the rifling on the other side. No BAD lever here as well. Totally agree, and I'll take it further. 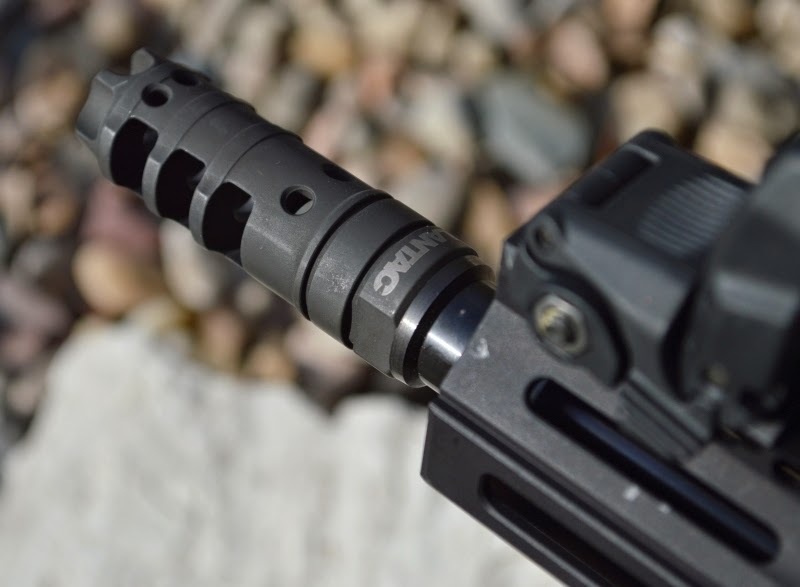 No AR needs an adjustable gas block to run reliably. I really like them to tune the rifle on the fly. My home defense AR is 100% colt and stock. Always runs. From my simple brain. Opening up the gas port delivers more gas (duh). Doesn't the addition of a suppressor essentially accomplish the same thing? More back pressure? The PWS Diablo issue was the extractor again. Less than 5 rounds an two broken extractors. I have no doubt PWS will take care of me but I'd like to have access to a better extractor. The PWS bolt is proprietary but the extractor is not. Any solid leads on an extractor that can handle 7.62x39 steel case? I am finishing up a 7.62x39 pistol with a 7.5" Oriion stainless steel barrel. I have not drilled out the gas port to 1/8" at this time. I have installed the .308 Cookie Cutter Comp, extra power hammer spring, and a Black Rifle Arms 7.62 dedicated BCG that has a bolt strictly for a 7.62 to accompany both brass and steel casings. I have not fired it yet as I am waiting for my BCG and should have it tomorrow. Are there any recommendations you might have at this time? I am still doing some research on dedicated 10rd and 30rd mags. Best fix is to cut buffer spring one coil at a time and it's cheaper and simple to replace if you mess up! Mine runs flawlessly now with ANY ammo. Hi if I may add my 2cents? I built a few 7.62x39 uppers and I found a 11.5 buffer with a wolf power spring a great asset to this combination. I had broken extractors making me crazy and almost ready to disassemble the upper and part out the 7.62 parts. But I called heavybuffers.com and spoke with slash and based on his experience I coughed up the 150 and brought the parts. While I waited on them I also went with a tactical ambush n.i.b. 7.62x39 bcg. Now I can run a slidefire and after a solid year of run time I can say I am one of the lucky ones who can just grab my ar and trust it will serve. I found with a fortis brake and due to the heavy buffer my shots are always on target and repeats shots are right behind that. Muzzel rise is limited now and very predictable. I urge anyone who can afford the extra loot to give slash a call. He has buffers for all calibers and I fof 1 love my 7.62x39 ar15 and I have since sold a few or my 5.56 ar15s.thanks all. Great article. I own a Colt sporter in 7.62x39 all factory original bought new here in the people's republic right before the ban. It has always run well but mags were near impossible until a few years ago I took advantage and replaced all my old frankenmags and now with the magazine rebuild kits gone they have dried up again. My rifle has inspired a couple of guys I shoot with to build them and like you they discovered the issues and now have no problem with them. I own and shoot other ARs but my old Colt is still my favorite iron sights and all. I can't say how many rounds I have put through it suffice to say that between my Colt and a Russian Sks I have gone through 3500 rounds or more. Thanks so much! Worked beautifully on mine. I shoot cheap junk amo with mag pull magazines. After 400 rounds that issue went away. I shoot junk amo and use mag pull magazines. After 400 rounds that issue went away. You said you opened up your gas port to .125, did you work through .90 up to get there or just jump into that big of port? Have you ever paid any attention to which clock hour your brass is ejecting. A very informative bit of info if you have. I believe you are using an adjustable gas block is it wide open or are you adjusting down. An additional question is what buffer weight did you use and are you using a stock spring. Good write up BTW, I have dug through and researched this build a lot and its the only place I have seen all the problems addressed and not just hit or miss, so I guess your difficult build had a silver lining in that it stumbled into all of the issues and informed a lot of folks. I purchased a complete upper from Palmetto State Armory, 3 ACS magazines, and after prepping with a a leaning and lube, have run hundreds of rounds with only one bad round. No issues from the rifle or magazine. I actually quite like the sound and feel of the 762x39 but I am a die hard 556 fan. If you do your fun event math, a trip to any sports venue for football baseball basketball etc with meals parking etc will run you $200 minimum for a day, and a night out with dinner drinks and movie will run about the same, so buy $200 worth of ammo have more fun. What spring and buffer assembly was used? I use only Standard buffer and springs unless I have some serious tuning issues I need to address. 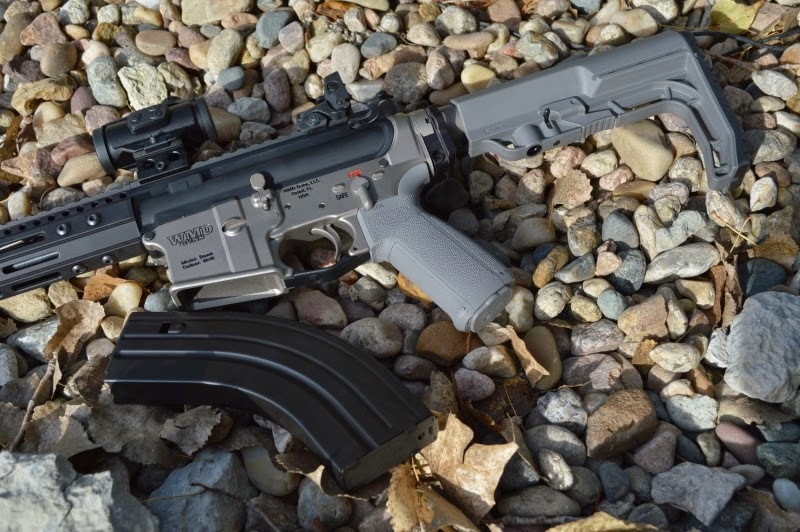 I am currently running a 10.5" AR pistol in 7.62x39 from Radical Firearms. I have two 30 round ASC mags and a 10 round as well. All run great except for one thing. I am pretty consistently getting a jam where the spent casing isn't fully ejecting out of the chamber before the next round is trying to feed, causing the jam. Any idea why the spent casing isn't making it all the way out of the chamber? Thank you. Likely the partial failure to eject is a function of not enough gas pressure. I would try some high end quality hot 7.62x39 rounds like Hornady or similar. If they all run perfect then it is likely an issue with lower pressure 7.62x39 rounds that are causing a soft or short stroke. If you can verify that you are not running a H2 or H3 buffer. If you can swap out the carrier to an AR15 (which are usually lighter weight) or an A2 rifle length buffer tube and spring. If everything starts running, then the answer is definitely an under gas problem. If it was me after I ran through all the above trouble shooting, I would just barely enlarge the gas port hole on the barrel. This is an awesome article!!! I built a 20 inch 7.62x39 rifle years ago and it's name is 'Boskov The Inconsistent'. As you say all the problems I could have, I had. It 's function was improved from 100% failure to eject to about 30% (but 70% fail to pick up next round) , so I'm gonna nab one of those TacCom ultralight buffers and see if i can address the undergassing without taking a drill to my rifle barrel. Thanks for such an astute analysis of problem and solution!